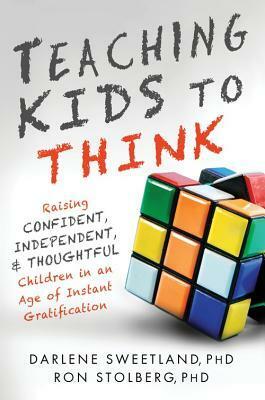 Teaching Kids to Think is an intelligently written answer to the problem of the IGG – Instant Gratification Generation of children. The authors have clearly thought out not only the advice they will give but also the presentation of it; it makes the book easy to use but also reference again as kids age. Most interesting is a quick questionnaire in the beginning; I think many parents will identify with the mistakes they are making as evidenced by the answers. The book breaks down as follows: Chapter 1: Parent traps; Chapter 2: Missed opportunities when parents rescue their children; Chapter 3: Make no mistake about it: everyone makes mistakes; Chapter 4: Understanding developmental stages; Chapter 5: Take advantage of critical periods of brain development; Chapter 6: Ivy league or bust: are we providing children what they really need to succeed? ; Chapter 7: The phones might be smart but what about us? ; Chapter 8: The trouble with technology: video games, social networking, and television; Chapter 9: Athletics provides more than just fun; Chapter 10: Why drugs and alcohol are so appealing; Chapter 11: Will you child be ready to launch? ; Chapter 12: Parents have grown accustomed to instant gratification, too; Chapter 13: Lessons learned. The authors identify five traps that affect parents today: The rescue trap (parents rescue their children from their problems); The hurried trap (parents meet their children’s needs quickly, not requiring them to be patient and wait); The pressure trap (parents push children forward too fast); The giving trap (parents give children something without them earning it); and The guilt trap (parents react impulsively because they feel guilty or unsure). These are discussed throughout the book and the consequences of falling into these traps provide the basis for many of the chapters. What I like about the book is that it doesn’t talk down to parents or try to use logic to trump the emotional reasons why helicopter parenting is so prevalent. Rather, the authors are quick to point out why parents do the things they do but also gently lead them toward a firmer solution to parenting. More than simply presenting tips and lambasting poor parenting, there is the knowledge of why parents are failing and that is used to show a better way. There is very good information in here and I especially appreciate the time and care that has gone into the book. It is an easy read but also an important one. There’s no lecturing of parents but the authors are appropriately stern on the importance of not helicoptering our kids into helplessness. Reviewed from an advance reader copy provided by the publisher. This entry was posted in ARC, book discussion, home schooling, non fiction. Bookmark the permalink.